Winter is coming, so what is a Prepper to do? Growing up in the upper mid-west, ice storms, heavy snow, sleet were all normal occurrences. Unfortunately, today, these extreme events are becoming more common. In the past, people were much more exposed to the elements than we are today. In some ways we are more vulnerable today than ever. Our forefathers understood their vulnerability to major weather events and prepared appropriately. Behind our four walls, with heaters blowing, we feel almost invincible. That is, until the power goes out. The home gradually gets colder and before long you remember just how relentless the cold can be. We are going to offer up several things to consider ahead of time should you ever find yourself without power in the winter. First things first – if you ever find yourself in a situation without power and heat, be sure you consider the water in your home and if you have any pipes susceptible to freezing. Pipes along exterior walls, close to windows in the basement, or in a crawl space will freeze first. If these pipes are made of copper, your chances of frozen pipes only go up! Flexible Pex Piping is less likely to freeze as the material has a bit of give (remember when water freezes it expands). If you find that your heat is out, and the temperature is going down, you should quickly create or make ready your emergency water supply. Also, be sure to set up sanitary stations with your prepper gear to use as the plumbing may be shut down. 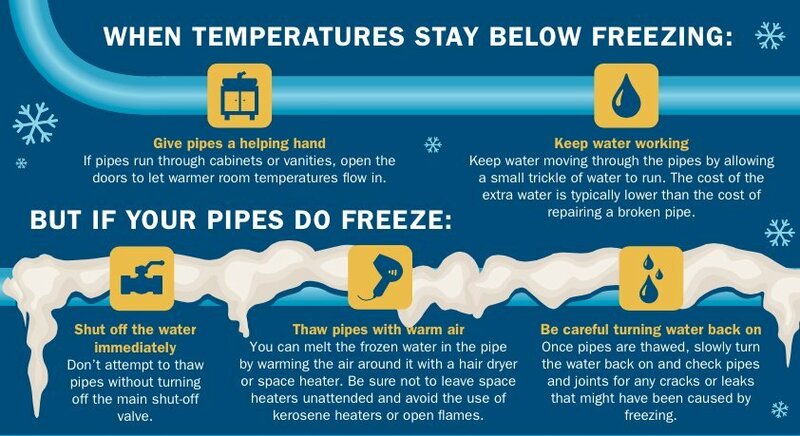 Once you are ready, and the temperature has fallen to the point where your pipes are vulnerable, then be sure to turn off your water at the main shut off in your house (not street). Then open a few faucets to relieve the pressure in the system and leave them open (especially vulnerable sinks). You can keep the water in your toilet to provide yourself with at least 1 flush per toilet while the water is out. One of the first and best steps to take during a power outage in the winter is to isolate the family into one room. Hopefully this is a room with a functioning wood fireplace. If that’s the case, you are a couple steps ahead. Blocking off doorways with covers or other insulating materials will allow all your spent body heat to remain trapped in that room. As well as any other heating resources you might be using. Its much easier to heat this smaller space than to attempt to heat the whole house. Having one room means you should also bring as many of the items you need for the day into that room. The less you go in and out the more heat you will retain. Heat generation, outside of your heater, is such an important thing to consider. This could come in the form of a fireplace, woodstove, handwarmers, alternate powered heater or backup power, which we will discuss later. You want to have at least one method of generating heat without electricity. While a wood stove is about the best option, you can also get things like kerosene heaters to use when the power is out. No matter which route you take just be sure you invest some effort into something. Also watch out for fumes if you are using fire to heat your space, make sure that there is appropriate venting to prevent carbon monoxide poisoning. I have even seen heat generated from mere T light candles and terra cotta pots! One of the often-overlooked methods for dealing with a winter storm power outage is staying busy. Move around or choose a task that requires a busy mind and hands. It’s a great time to catch up on tasks that you have been putting off – or consider keeping a few games or books in your isolation room. You can also do work outside in the sun. A sunny cold day can warm a working body. However, if its too cold you will do best to stay active in your isolated room and generate the heat to be captured. Also make sure you have enough food and water to make it worth expending all the energy going outside. In modern times there is no answer that beats the portable generator. Maybe a whole house generator, but that is often out of the scope of those on a budget. A high-quality portable generator can be had for just over $500. Check out these invertor generators here. This generator can power space heaters and offer up many more options for staying warm in the cold. It can also provide you with entertainment and things of that nature to pass the time during the power outage. If you are truly concerned about cold weather and power outages invest in a 5500-watt generator and you will be able to do most anything you need to. That generator will run for 8 hours on about 5 gallons of gas. Keep that in mind. A generator without gas and oil is useless. Separate from freezing pipes discussed above, water is not often something that comes up when you think about dealing with the cold, but water is a big deal. Winter is a viciously dry time and sitting in front of a fireplace or wood stove will exacerbate that. You need to have a stockpile of water that can be used to hydrate your family when they are in need. Another benefit is drinking warm tea and hot liquids. Nothing warms you like a hot drink. Store water that can be kept inside or brought inside as supplies that are left in the garage or shed could wind up frozen! Check out this article on long term water storage here. Be sure you have a bunch of ready to eat foods on hand. Obviously freeze-dried meals are going to take the cake because you will have access to a hot meal (more info here), if your stove is electric. Having foods that don’t require heating are great also. You burn a lot of calories being cold. Canned soup and stew are also great options for the cold weather survivor. What’s better than a hot bowl of soup on a cold winter day? The Inuit’s wore shoes called mukluks in the cold. These were loose fitting and light. One of the reasons for this was to fight constriction of warming blood from getting to the feet. Many people where tight boots in the winter and complain of cold toes and feet. Most of the time we are doing ourselves harm with those tight boots. From long johns to fleece pullovers add as many layers as you need to keep warm. Also remove those layers if you start to sweat. That moisture is going to make you cold as well. 9) Night Time Will Be the Coldest! While it might seem like a great convenience to have blazing fire and extra power during the day, when resources are limited you must think about the night. Nights can drop as much as 20 degrees. That gap can be very important. If you go below freezing or below zero those nights are going to be much harder to deal with. Sleep is critical so its always best to save the bulk of your resources for the nights as they will be significantly colder. Really burn the woods and run the generator at night. During the day you can stay busy to keep warm. As you can see there are many options at your disposal when it comes to surviving a winter storm power outage. If we are talking about an extended outage where the power was off for the entire winter than you would need even more resources. Surviving for a few days in a blizzard should be more than realistic with the preps we have mentioned above. Stay warm!